Enjoy the fresh air while you eat with the Sol Dining Set with Santorini Fire Pit Table. 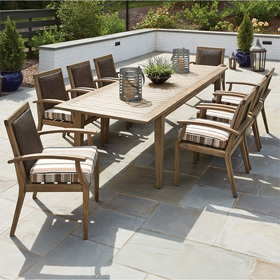 This set is constructed from high quality wrought iron for superior outdoor performance. Six can dine in comfortable plush seating that rivals any indoor furniture. For added comfort this set includes both stationary and motion based seating. The eye catching centerpiece of this set is the Santorini 42" x 72" Dining Fire Pit Table guaranteed to provide unmatched heat, light, and style to your yard. All Ow Lee furniture is guaranteed under warranty to resist mold, mildew, and fading. Swivel Rockers 26.5"W x 32"D x 40"H 64 lbs. Arm Chairs 26.5"W x 31.75"D x 40"H 56 lbs. Fire Table 72"W x 42"D x 29"H 339 lbs.